Poppies of Iraq, written and drawn by husband/wife creative team of Brigitte Findakly and Lewis Trondheim, is a very personal, often disjointed story of a woman growing up in Iraq during unstable times. 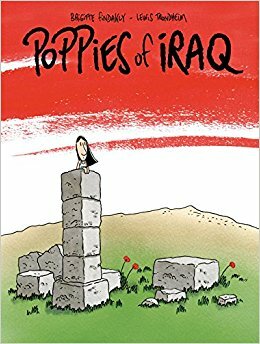 Very straight forward in its narrative, Poppies of Iraq heavily relies upon six panel pages with brief descriptions over each panel. The dialogue is scarce since the narrative tells much of what is going on. The book does contain a few splash pages and pages of real photographs of Brigitte’s family, but it does primarily stick to the six-panel layout. What I find most interesting about the book is its narrative structure. The first half of the book contains many instances of moments captured by our creators, many of which are separate from the grand narrative. Small memories come to the surface, and those are offered to us, just as we experience and remember our own childhoods: in segments…some good and some not so. As the book goes on, however, the story seems to tighten up and we get less and less of those snippets the older our protagonist becomes.